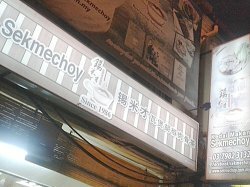 Restaurant SekMeChoy 锡米才, is a family oriented restaurant which has been well established since 1986. The restaurant was named after their founder, Sek Me Choy in Cantonese meaning Tin Mine Choy. 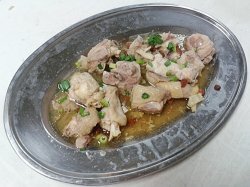 The Salted Steamed Herbal Chicken 盐酒药材鸡, is one of the signature dish from Restaurant SekMeChoy. This dish was awesome and deliciously prepared in the authentic way. 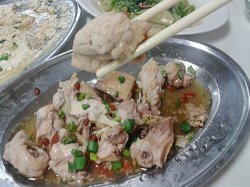 Basically, the main ingredients for this popular dish includes of chicken cubes, wolfberry, donggui, spring onion and a hint of Chinese wine. Texture of the herbal chicken cubes was firm and juicy. This dish was steamed to perfection and the gravy was rich in Chinese herbs flavor and tasted like Chinese herbal soup. Overall, it was quite salty but it was okay to consume with rice. Reviews submitted by the same member to the same restaurant within 30 days.